Last Monday signified the bicentennial of Jane Austen's most influential novel, Pride and Prejudice. Published on January 28th 1813 by Thomas Egerton, it was the second of her works to be launched upon an unsuspecting society (the first being Sense and Sensibility). 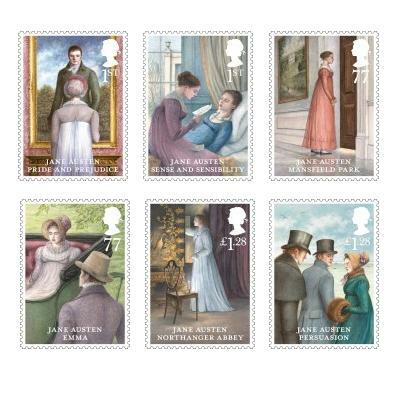 To commemorate this special anniversary, the Royal Mail is releasing a series of Jane Austen stamps later this year (which I can't wait to get my hands on!). As you can see, each individual stamp illustrates a scene from one of her novels. They're released on 21st February in the UK. If you live overseas and don't want to miss out, you can also buy a set via Royal Mail's website. It'll be exciting to see how many other Austen-related special issues and events present themselves over the year! Are you doing anything to celebrate the 200th anniversary of Pride and Prejudice?